I once had political aspirations. It was the early 1980s. A federal election was brewing. At the same time a tiny chain of British islands in the Caribbean – the Turks and Caicos – had expressed interest in forming an association with Canada. What a great idea: Canada’s own warm, winter destination. No more currency exchange swindles or fighting with hefty American tourists in a Cancun buffet line-up; just a happy bunch of Canucks soaking up the sun in our own polite corner of tropical paradise. I would make political hay by running for office on this simple, single platform: promoting a union between Canada and the Turks and Caicos. It seemed a worthwhile diversion from Alberta’s traditional campaign issues: complaining about Quebec and letting the eastern bastards freeze in the dark. Alas, I didn’t run and my nascent political ambitions, like the election, came and went. The Turks and Caicos dream faded into the blue yonder; our Prime Minister went back to exclaiming “fuddle duddle” in Parliament and the West returned to detesting the East over trivial issues such as who was going to get Alberta’s gazillion petro dollars. And instead of milking the federal treasury I ended up in law school and eventually Red Deer where I practiced law for a quarter century before concluding that life was too short to spend behind a desk – even if it were in the corner office. But some people follow through on that early opportunity to chart a different course. Bruce Twa, a law school buddy, had lawyered through a few cold Alberta winters when a chance phone call offered him the prospect of practicing warm-winter law – in the Turks and Caicos. Bruce jumped at the offer. He has now been resident in the “TCIs” for over twenty-five years, transacting real estate deals on behalf of wealthy, sophisticated, discreet clients – when he’s not boating in the azure-coloured waters or snorkeling amongst parrotfish and turtles in the coral reef surrounding the islands. I had promised (threatened?) to visit Bruce on numerous occasions over the years. Finally, arrangements were made. We’d see the tropical paradise Canada had snubbed and find out how my naïve 1980s political ambitions may have panned out. My wife Florence and I learned even before clearing customs at Providenciales airport that the TCIs still maintain a quaint “small-island” feel. Bruce and his wife Darlene had graciously offered to host us during our stay but the border guard wouldn’t allow us entry. We didn’t have Bruce’s home address. The officer shook his head many times, threatening us with expulsion, before calling in his superior. She looked at our paperwork, “Oh, you staying with Bruce? I just give him a call and get his house number.” She dialled and five minutes later we were standing on the curb, throwing our stuff into Bruce’s pickup. We had only four days in the TCIs; a wise use of time was paramount. I wanted to evaluate whether Canada had blundered or done right in spurning the wishes of this British Protectorate. A quick but thorough analysis of the culture, economy and history was in order. I’d keep a tally of the positives and negatives. We began our research in a calculated, scientific fashion: so we went for beer and seafood, stuffing ourselves with fresh conch and island brew. The conch fritters were fantastic but the local beer (Turk’s Head) was awful. Score: one/one. Darlene, nice. Turk’s Head, not so nice. In the morning Bruce offered us the use of his beater truck so we could explore the island. I was a bit nervous about driving a standard stick shift in a strange country. “Don’t worry,” said Bruce, “Provo (that’s what the locals call Providenciales) is small, you really can’t get lost”. I felt better until I turned out of his driveway onto the main highway and realized everyone was driving on the wrong side of the road. I geared down and careened into the steamy Caribbean chaos. Our methodical investigation continued… with lunch by the sea at Grace Bay – named by Condé Nast as one of the top beaches in the world. The fish was delectable and the beer (Presidente, imported from the Dominican Republic) palatable. The score was starting to favour the unionists. That afternoon Bruce abandoned his clients to take us on an insider’s tour of his small island. The TCIs are a string of Cays (“Keys”) located at the eastern end of the Bahamas chain. The capital is Grand Turk, an island 100 kilometers from Providenciales. There are numerous small Cays – mostly uninhabited – between these two major islands. Due largely to the influence of Canadian ex-pats, Provo has evolved to become both the commercial and tourism center of the TCIs. Bruce drove us through the high-rent district. If you are in the market for a multi-million dollar beachside home, Provo has plenty to offer. And if you change your mind and decide to sell, there is no tax payable on any gain in value. In fact there’s no tax of any kind in the TCIs: no tax on income or capital gains and no annual property tax on your house. But import duties and the cost of living are painfully high. Duty can be as much as 45% of a car’s value. And when you buy your dream home in paradise there is a one-time stamp fee payable equal to 9.75% of the purchase price. On a $1,000,000 property the fee is almost $100,000! Ouch, that’s a lot of postage. These punishing import duties have led to some clever avoidance strategies. For example, the Turks and Caicos has many, many churches… all exempt from duty. Thus, even the humblest pastor usually drives a shiny new SUV. We also toured the low-rent district, a stone’s throw from where the millionaire’s reside. The poor area, dubbed Five Cays, is where the immigrant workers – primarily Haitian – live. The unmaintained road into Five Cays is almost impassable. This explains the abandoned vehicles we encountered – some converted into makeshift shelters; and many of the shanty houses here are a work-in-progress. “We build piece-piece,” the locals explain. Bruce often does free legal work for the poor of Five Cays. He should be careful. This kind of attitude could bring an end to lawyer jokes. There are a number of different, confusing categories of residency in the TCIs. We arrived on a temporary (30 day) permit. Bruce and his wife are permanent residents. The Haitians rely on work permit residency. Then there are the “Belongers”. Only those persons born on the islands (with island ancestry) are true citizens, entitled to vote and hold office. Bruce and Darlene have been permanent residents of the TCIs for over two decades but can’t vote. They’ll never be Belongers. This bizarre restriction on citizenship has led indirectly to a major challenge facing the Turks and Caicos: a legacy of nepotism and corruption. One afternoon Bruce took us snorkeling. We boated past the palatial home of ex-premier Michael Misick in the Leeward neighbourhood of Provo. After building his mansion Mr. Misick leased it to the government. Then he moved in – as tenant – and collected $10,000 a month in rent from government coffers. The same day we cruised by the house, Interpol apprehended Mr. Misick in Rio de Janeiro on an international arrest warrant on charges of corruption and maladministration. Michael Misick apparently lacks neither cash nor gumption. Bonefish put up a helluva fight! Time was running short. To judge matters objectively I needed more first-hand data… so I went bonefishing with “Bar”, a local guide. Wow! The fight presented by these fish is absurd. 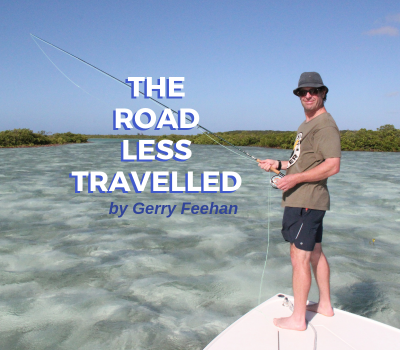 If you are a fly-fisherman put this adventure on your bucket-list. One moment I was admiring a juvenile nurse shark hovering in the shallow waters beneath Bar’s flat-bottomed boat and the next the line was spinning uncontrollably outward. It was ten minutes before I had that slippery little devil in my hands. Motoring back to Provo we trolled past Bruce Willis’ house on Parrot Cay but the place looked deserted. Perhaps he was over at Demi Moore’s place having an ex-spouse, ex-pat spat. I owed Bar $500 for the morning’s fishing (I told you the TCIs are expensive). We agreed to meet at a bank up the road – but as we pulled in it was being robbed. “What happened?” I asked the security guard next door. “Sketchy… it happen piece-piece,” he answered cryptically. Crime is not really an issue in the TCIs but, embarrassingly, the Provo Police Station had also recently been burgled. Thieves made off with guns, ammo and drugs held for pending court cases; adding insult to injury the police force’s new uniforms ended up at a local pawnshop. Then there’s the “Potcakes” – Provo’s stray dogs. Packs of barking Potcakes roam the streets of this little island at night, stealing sleep from rich and poor alike. Unfortunately, the government funding for a much-needed sterilization program came unleashed amid allegations of… corruption. Bruce retrieves an AWOL Biana. Bruce’s dog Biana is a former Potcake, now fully civilized. During our boating afternoon Biana grew seasick but jumped overboard rather than vomit in her master’s vessel. Bruce cut the motor, dove in and brought his AWOL canine back aboard; then she threw up. The final tally? It’s difficult to say. On our last night any negative karma evaporated when I stepped onto Bruce’s deck, into the sultry Provo darkness, and smelled the air. Have you ever encountered night-blooming jasmine? The fragrance is difficult to describe but should I ever again detect its beauty floating on a tropical evening breeze, the recollection will return like scented déjà vu.